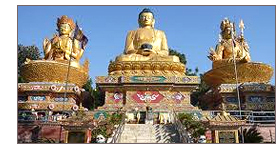 Swayambhunath Stupa is among the oldest religious sites in Nepal. Shaped as a golden spire, the stupa is uniquely different from others as Buddha's eyes and eyebrows are painted on it. Boudhanath Stupa is one of the largest spherical stupas in Nepal. The world heritage site, Boudhanath is surrounded by 29 Tibetan Gompas (Monasteries & Nunneries). Lumbini is famous as the birthplace of Lord Buddha. Present day Lumbini dwells around Buddhist temples, Ashokan Pillar and revered Stupas.